Help Dad Protect the family this Father’s Day! Becoming a dad changes everything. Most of all, it changes you. Scientific research has confirmed that—for dads as well as moms—having a family literally rewires your brain. Before kids, you could sleep through freight train noise. Today, one faint cry from the next bedroom gets you up and lumbering down the hall. Before kids, crying babies in public made you cringe. Today, you might walk over to see if you can distract the baby with silly faces. The transformation is remarkable. Likewise, when you travel nowadays, part of you enjoys the break, but the “new” you doesn’t feel right about being cut off. That’s why many dads opt to stay connected and keep things secure with a Forest smart home security system. Old security systems were great at letting you know something bad just happened. As a vigilant dad, you know that’s not good enough. A modern security system—much like you—can detect trouble early so that you can act quickly. It combines advanced connected devices like motion-sensitive doorbell cameras, contact sensors, and smart smoke detectors with powerful cloud intelligence that can discern what might be happening. When there’s an issue, the system is designed to act—sending a smartphone alert if there’s motion on the front porch, for example, or shutting down your home’s AC if smoke is detected, or sending a reminder about an unlocked door. Just ensure that you have the Alarm.com app on your phone before you leave home, and smart home security can take care of the rest. 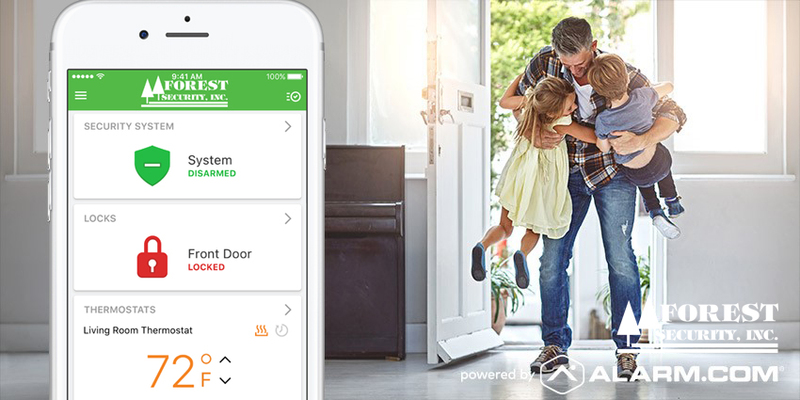 Even with our proactive security alerts, it can still be hard to shake the feeling that your house could be a target for burglars when you’re gone. This is where a true smart home security system can give you peace of mind. All Forest Security Systems include our 24/7 professional monitoring, with a connection to our central station staffed by security professionals who can respond to alarm signals in an emergency to assess the situation and potentially dispatch help to your home. Your house, your rules—but is that still the case when you’re not there? Even when you’re away, you can use our system to let you know what’s going on. Take curfew, for example. 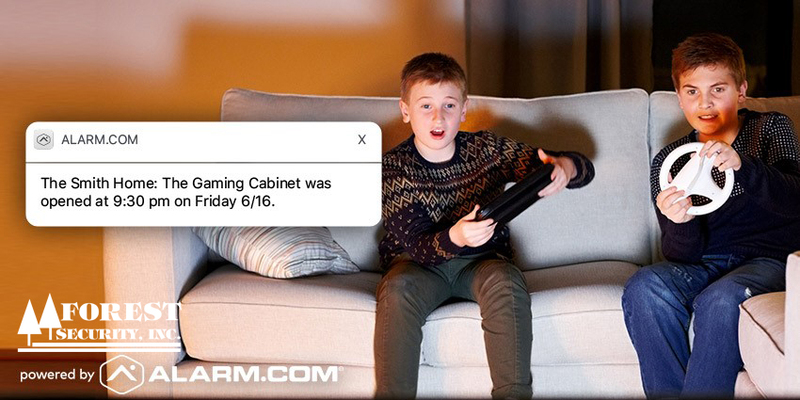 Give each of your kids their own user code for the door and Alarm.com’s smartphone alerts (including a no-show alert option) will let you know if they’re out too late. 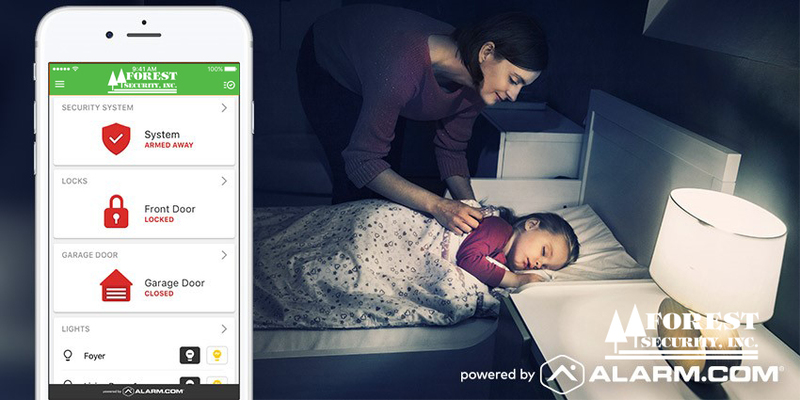 If double-checking the house last thing at night is your job, you’ll appreciate being able to do it from anywhere. Open your app once you know everyone’s in bed, and you should be able to see the status of your home’s doors, windows, garage doors and security system. If things are out of place, it only takes a couple more taps to lock up and arm the system. 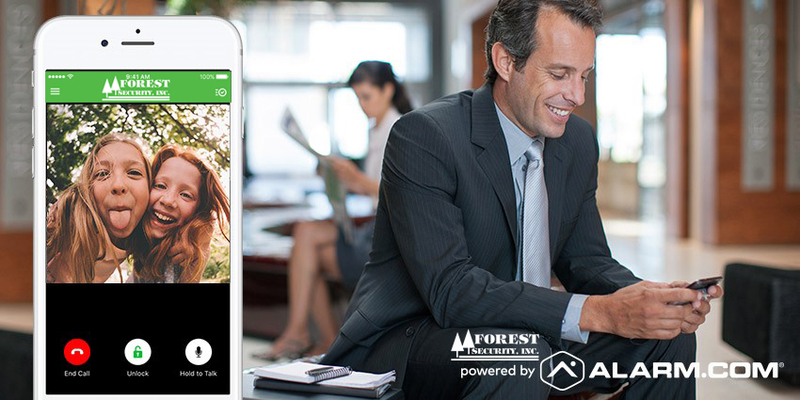 With smart home technology, tamper resistant features and proactive safeguards, Forest Security and alarm.com’s smart security technology is trusted by millions. Call Forest Today to receive your no cost, no obligation security proposal: 708-452-2000.